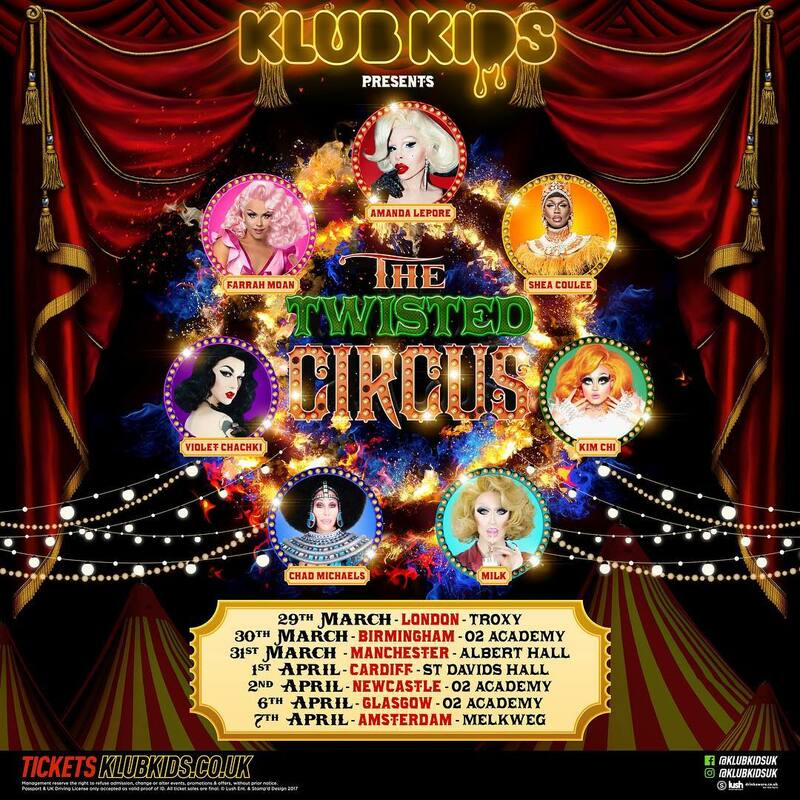 On Friday 30th March, national promoters Klub Kids present ‘the biggest and most unique show of drag HERSTORY’ – as The Twisted Circus comes to town, stopping off for one night at the O2 Academy Birmingham. Doors open from 6pm for VIP ticket holders and 7:30pm for general admission. Minimum age of entry is 14, with under 16s requiring adult accompaniment. Standard tickets are priced at £25 (Eventzilla) and £30 (Ticketmaster) plus booking and service fees. VIP tickets, which include a meet and greet with the stars performing, are priced at £100 from both outlets – although the booking and service fees do vary. The Twisted Circus is presented by Klub Kids – for direct show information, click here to visit their Facebook event page. To buy tickets online, click here for Eventzilla and click here for Ticketmaster. March has been a great month for drag in Birmingham. We’ve had Alyssa Edwards bringing her The Secret Is Out Tour to The Glee Club Birmingham, with BenDeLaCrème hot on her heels for a show at the same venue on 29th March. Former figure skater and Marc Jacobs model, Milk, will be appearing at The Twisted Circus. No stranger to the glitz and glamour of showbiz, Milk was recently announced at the new face of Madonna’s skin care range, MDNA. Now fresh from her appearance on Ru Paul’s Drag Race All Stars Season 3, Milk promises to be ‘udderly fantastic’. Next is international seductress, aerial acrobat, and Drag Race Season 7 winner, Violet Chachki. Having performed drag and burlesque alongside icons such as Dita Von Teese, Chachki blends striptease, fetishwear, and her unmistakable vintage aesthetic, all in the name of ‘distorting the gender binary’. Twenty-three year old Texan starlet, Farrah Moan, is also appearing at The Twisted Circus. Starting out her on stage drag career in Texas, Moan’s Barbie doll looks have seen her cast on Drag Race Season 9 and perform on the Las Vegas strip. The Twisted Circus also presents Kim Chi, a towering 7ft queen and ‘ever evolving chameleon’. Born in the U.S. and raised in South Korea, Kim Chi’s upbringing informs her high concept looks which ‘encapsulates the transcendental nature of drag’ and celebrates performance art. Chi is also the name behind the doughnut scented ‘Kim Chi Liquid Lip Color’, alongside other products for the Sugarpill Cosmetics. Next up, The Twisted Circus welcomes Chicago based model and musician, Shea Couleé. Having just released her visual EP, Couleé-D, Couleé uses her background in costume design to create breathtaking fashion and film. Just don’t mention Azealia Banks. Also performing is international Cher impersonator, Chad Michaels. Part of Califonia’s longest running female impersonation show, The Dreamgirls Revue, Michaels went of to be the winner of Drag Race All Stars Season One and has since appeared in Jane the Virgin and 2 Broke Girls. Finally in our box of Twisted Circus treats, we have Amanda Lepore. Said by photographer David LaChapelle to have, “the most expensive body on Earth”, Lepore is a model, singer, performance artist and transgender icon. Following her time as an original New York Club Kid in the early nineties, Lepore has gone on to release two albums, a memoir, and even her own Swatch watch. The Twisted Circus comes to the O2 Academy on Friday 30th March, as presented by Klub Kids. For direct show information, with links to online tickets from Eventzilla, visit The Twisted Circus Facebook event page – click here.